A little thinking after the last post lead me to the idea of persisting objects beyond the scope of a running program, a super singleton. Because an IOC container abstracts the source, and in some ways the lifespan, of an object, there is nothing stopping me from persisting the object and using it between application instances or other systems. The code would never have to know. I used db4o in my code because of the simplicity, and native object storage. If you have never used db4o, I suggest it. Also, this provider required explicit disposal, so I went back and implemented IDisposable on the Repository and the SingleServiceProvider. I have not resolved how to handle events when the object has not been re-hydrated or dealing with multiple applications touching the same object database. Perhaps I will think about that some other time. The biggest thing I have learned from this is that building something myself helps me understand. Now I am going to to try Autofac. My initial IOC container was an automatic factory. When GetInstance was called it executed the stored factory method and returned. You could technically put anything you wanted into the factory method, including a singleton instance or a database call, but it is no better than a standard factory method. While looking at some of the IOC containers listed in my last post, I noticed the user could select the lifespan of each type. So, I went back to the workbench. 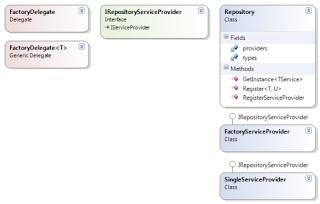 I have abstracted out the lifespan from the repository, through the IRepositoryServiceProvider interface. This change also opens up the possibility for creating custom lifespans. Inversion of control is an interesting pattern, but it has a flaw. When building a system following the IOC pattern, the code bloat seems to bubble up to the top. The higher level objects start creating and managing all the required parts. This starts to fall down when you scale it up beyond a small number of objects. The accepted solution is to move most of the object creation into an IOC container, like Windsor, StructureMap, Autofac, etc. You register a type, and dependencies, with the IOC container and then just ask for it when you need it. That is great, except I don't know how or why they work the way they do. Most people have responded to my questions with the classic open source creed, “you can look at the source.” Reading the source is like reading a scientific research paper. So, I tried building one myself. After a few hours of tinkering, my basic IOC container is 16 lines, including error handling. 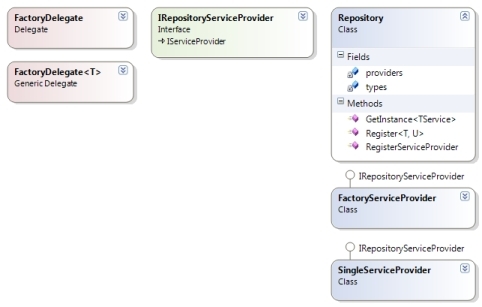 A factory method is registered for each type you want the Repository to handle. Each time the GetInstance method is called, it retrieves the stored factory method, executes it, and returns a strongly typed result. I think I will explore this a little more. The theater production and the musical are not dead. But I do think they are making themselves inaccessible. Doctor Horrible's Sing-Along Blog shows a promising path. I would watch more theater and musicals if it was as accessible as a music video on YouTube. I will welcome the day this bandwagon comes. I found an old blog post from a greggles. I don't know who he is, or what he does, but he has a good point. The web application inside the browser is ideal for simple applications, but starts to suffer with higher complexities. Now, you could argue, any number of client side frameworks(AIR, Silverlight 2, Gears, etc) would solve this problem, but it still raises a question on the role of web browsers as a whole. The web browser was designed as a document viewer for files on a remote server. Every browser and standard was built to support that. With time, people grew tired of bread and water. So, now we have a "rich" ecosystem of web applications hosted at every point on the globe. and are ubiquitous. As a programmer, I know all the features listed are surmountable with existing programming techniques and focused effort. Should the web browser continue to take on this role as programming platform? The logical path is to have the web browser evolve into a pure data format viewer component and run applications inside an isolated virtual machine. With an automated system for synchronizing code and data, all the points from above can be solved while allowing for the full use of libraries, tools, and languages available to system programmers. Now I just have to figure out how to make it easy to use and build it for free. [Edit] (2008.07.20) I just read the wikipedia entry for application virtualization expressing a better point. Oops. Next time I will think about researching something first. Summary: If you have the VM hardware extensions, just develop inside a VM. I suggest VirtualBox. Through curiosity, and work, I encounter more programming stacks than one machine can handle. My home machine previously contained Android, Python, PHP, .Net, Flex, Ruby, and other stacks resulting in a slow machine and configuration rivaling a game of Pickup Sticks. It also made moving between machines a big pain point. My work machine started to feel the same strain with a WAMP and an ASP.Net stack when, while fixing a coworker's laptop, I found other people had the same problem. Their specific machine was running three different web servers and four different databases, not to mention the two IDEs and a smattering of smaller tools. At that moment I realized a VM was more than an instant server. It solves the "spew" problem, when software throws-up dependencies all over your machine for its own benefit. Your "spew" factor increases with the number of programs installed, and it can get messy very quickly. From that point on I have developed my projects in a VM. I have one VM per programming stack and a base image to quickly copy when I need a new one. I should note that I use VirtualBox in seamless mode with the VM hardware extensions (VT-x / AMD-V). 1. Get more RAM and a faster hard drive. 2. Skip Vista unless you need it. 3. Ditch both Microsoft Virtual PC and Microsoft Virtual Server. 4. Defrag the host OS more often. 5. Choose a different theme for your guest OS.